I have a nephew in American Fork, Utah that was baptized this weekend, so the Avimor Bird Blogger family loaded up the Honda Odyssey mini-van and cruised down to our southern neighbor. We weren't in any hurry on Friday going or Sunday coming, so we made some family adventure stops that included heavy doses of birding. We decided to make City of Rocks be a stop on our way. Awesome! Spectacular! Amazing! All appropriate words to describe that scenic place that I had never even heard of until other Idaho birders mentioned it earlier this year. (And I've lived in Idaho off and on for 19 of my 32 years.) In fact, it was so much fun, that my birder father-in-law, Lynn Davenport decided to caravan with us on the way home from Utah to make another stop at this Idaho hidden treasure. (He's been in Idaho almost all of his 63 years and had also never been there before.) 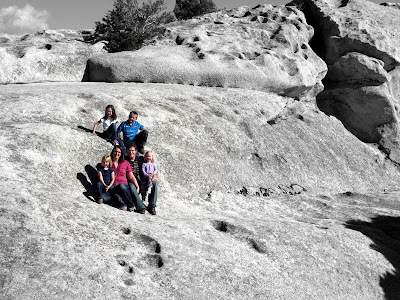 My kids loved hiking around and climbing on the really cool rock formations. They endured my birding well on this trip. Jessica took the picture above of my oldest three while the baby napped in the car. I was up in the pinyon pines and junipers looking for birds of course! Given the season, it was not particularly birdy, but the birds we did see were good ones in the sense that I don't get to see them all that often. For example, Western Scrub-Jays and a couple Loggerhead Shrikes were both Idaho firsts for me. We also enjoyed two Golden Eagles and a Prairie Falcon, which were Idaho first of years on my list. We originally ID'd the Prairie as a Peregrine, but Lynn had longer scope time and after further review of color pattern coupled with habitat, it was most likely a Prairie Falcon. A pair of Eurasian Collared-Doves in the town of Oakley, Idaho were also Idaho first-of-years for me. Other fun-to-see birds seen in the City of Rocks area were Gray Partridges, Mountain Chickadees, and Townsend's Solitaires. Friday afternoon we met up with Lynn and my sister-in-law at the Bear River Migratory Bird Refuge just off of I-15 near Brigham City, Utah. We got to see 21 species of cool birds, like the Short-eared Owl and five types of Grebes. My non-birding wife is actually really good at spotting birds. She pointed out several Long-billed Curlew feeding on a nearby bank that I would have driven right past. The bird of the weekend had to be my life bird #313, a Bonaparte's Gull!